Eh – Not my cup of Bruce. 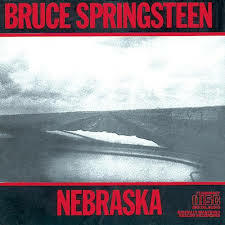 In 1982, he came out with what seems to be a tribute to Woody Guthrie, in a “this land is your land…” sort of album, sans E Street Band. Just Bruce, his guitar and his harmonica. I like harmonica, in moderation, but there is just so much one can take. In fairness to Bruce, I’m sure he wasn’t thinking of me and my workout routine when he wrote these songs and compiled a rather bleak album, which never made it out of the cellophane. $5.99 sale price. It’s not even inspiring me to go off on one of my tangents. Except maybe that I was thinking, now with the time change, I don’t like working out when it’s still light. There’s something private about night. Then while dancing toward the window, I saw two ferries pass each other, one going to Staten Island, and the other returning from it, and thought that was kind of cool. I think I still have the button someplace. Possibly the bowtie and the gloves as well. I thought I looked cute.